New Delhi: Despite the decisive roles it played in the last two parliamentary elections, the Bahujan Samaj Party (BSP), one of the very few political parties that increased its share of votes in the 2009 Lok Sabha elections, may remain a mere spoiler in Tuesday’s assembly elections in Maharashtra, say analysts. The reasons: the very nature of its support base as well as its style of functioning, they add. They say that the BSP, which has grown steadily in Maharashtra—but never opened its account in the 288-member state assembly—has been overshadowed by the advent of the third front, the Republican Left Democratic Front (RLDF), in the state. The electoral battle in Maharashtra has, over the past few elections, ended up being a fight between the Congress and the Nationalist Congress Party (NCP) on the one side and the Bharatiya Janata Party (BJP) and the Shiv Sena on the other. “The BSP had managed 4% votes in assembly elections and 5.43% in Lok Sabha elections in 2004, largely because of the mismanagement of the Congress party. It is true that its vote share increased, mainly because of the BAMCEF (All India Backward and Minority Communities Employees Federation) and DS4 (Dalit Shoshit Samaj Sangharsh Samiti)," added Mrug. BSP founder Kanshi Ram had launched both the organizations. 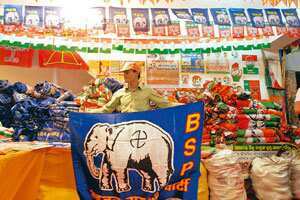 During election campaigns in the state, BSP leader Mayawati did draw large crowds, but the coming together of various factions of the Republican Party of India (RPI), and its decision to join the Left and the socialist parties in RLDF is expected to hit the BSP’s prospects. Analysts say the BSP support was largely drawn from a voter base that was split due to the disarray in RPI. According to Mrug, this as well as Mayawati’s unwillingness to allow any other leaders to rise to the top would block the growth of the BSP—currently the ruling party in Uttar Pradesh—in Maharashtra. “It will remain a spoiler now," said Mrug. However, Tanuja Khobragade, the BSP candidate from Chandrapur assembly constituency, said the party would emerge as surprise winner in many constituencies as it is the only party that has raised relevant issues. Khobragade has raised issues such as pollution and unemployment in her constituency, which is surrounded by coal mines. The BSP, which has 281 candidates in the fray in Tuesday’s elections, has also tried to highlight the alleged fallout of the economic policies of the Congress-NCP government in the state and the United Progressive Alliance government at the Centre; the increasing number of atrocities against the Dalits in the state; and the poor state of the Maharashtra economy. The BSP’s presence has been very visible in the Vidarbha region. Huge hoardings, picturing Mayawati and the party symbol elephant, loud speakers screaming haathi haathi (elephant, elephant), and party workers wearing purple stoles can be spotted in almost all towns in the region. That may not translate into votes. “She won’t be able to gather many votes here. Maybe around 200 of the 12,000 votes here," said Samar, a resident of a largely Bengali neighbourhood in Chandrapur town. He gave only one name. J.D. Ramtek, a BSP activist, admitted that his party had helped both the fronts (Congress-NCP and Shiv Sena-BJP) in the past. “But this time, we want to win some seats in Vidarbha," he said. Whatever happens, Ramtek added, indirectly agreeing to the general opinion among analysts, the party would “decide who wins the elections".